This tastes so sweet – but how sweet? The guys behind the ‘sugar delirium‘-blog created a comprehensive way, that one can easily grasp the sugar content of common foods. 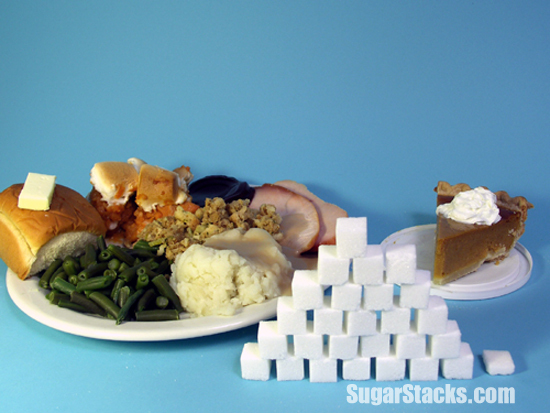 On www.sugarstacks.com/ they provide pictures of common foods alongside their sugar content counted in the number of sugar cubes. Impressive is how much you eat in a single thanksgiving dinner (see picture). So how much sugar is healthy per day? It is a question hard to answer. On average, an intake of about 30g or 7 cubes of sugar is recommended in the case of free sugar – however, intake of complex sugars bound in some form of whole grain may exceed these measures. Also, the recommended amount varies for different types of sugars, e.g. glucose or fructose. And, recommendations seem to need to be adapted to distinct populations and individuals. Sugar delirium regularly discusses the frontiers of scientific findings regarding sugar intake recommendations. In the meantime, their sugar cube project gives intriguing insights. Have a look on their fruits collection for example. Fruits are often recommended as the healthiest form of carbohydrates. 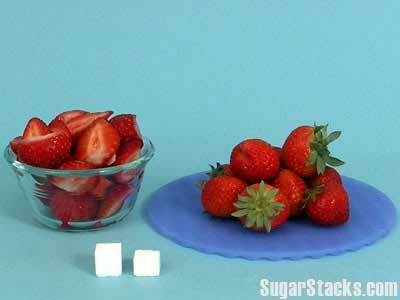 But, some of them are truly sugar bombs, while others, such as strawberries, are surprisingly low. All fruits are not equal. Snacking only a little bit on grapes drives your sugar intake through the ceiling, meanwhile you need to chew a little bit longer on a lot more pineapple to reach similar levels. Previous PostBed your Sweet Potato!